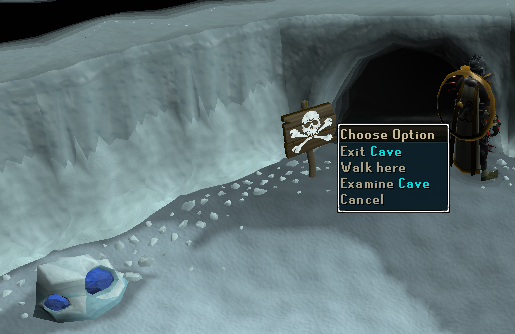 This underground ice cave, located near Port Sarim, is mainly used for the Knights Sword Quest and Defender of Varrock, but there are also some higher level Slayer Monsters in the Dungeon requiring 72 Slayer to kill. 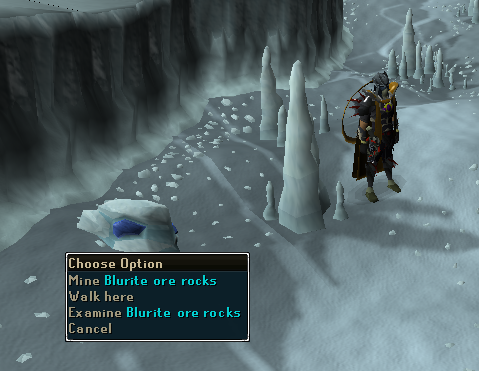 This is the only location in the game where you can mine Blurite ore. The Ice Cavern is quite easy to find. It's located just south of Port Sarim, on Thurgo's peninsula north of Mudskipper Point. Simply climb down the ladder to enter the Ice Cavern. 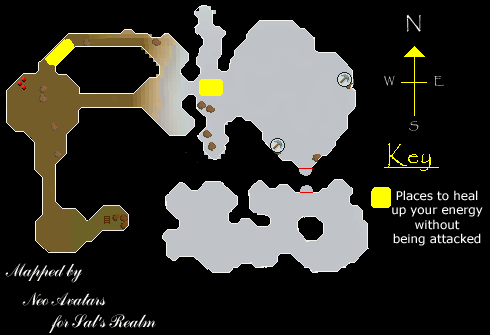 If you have unlocked the Port Sarim location on the Lodestone network, simply teleport to the lodestone and walk south through the town to the peninsula. Once you have completed the beginner, easy, and medium tasks of the Lumbridge/Draynor task system, you will have an Explorer's Ring (3). 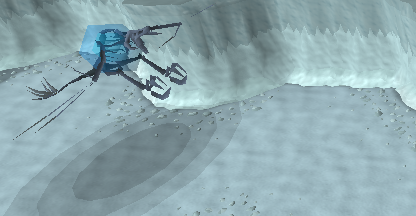 When operated, this can teleport you to the cabbage patch north of Port Sarim. Walk south past Port Sarim, following the docks. This enchanted Dragonstone amulet can teleport you to Draynor Village, just east of Port Sarim. 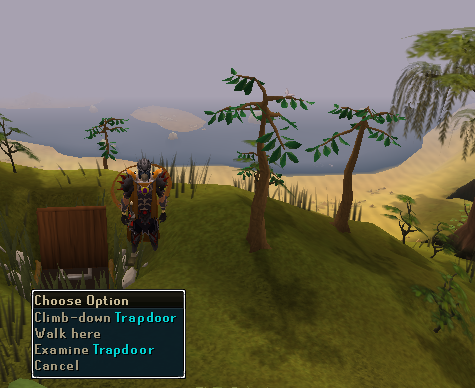 Walk north and through Port Sarim following the docks south toward the dungeon entrance near Thurgo's house. Charter ships are located in most of Runescape's ports. For a small fee, (reduced by the Ring of Charos (a), enchanted after the Garden of Tranquility quest) you have the option of taking these boats to Port Sarim. From there, follow the docks south. If your clan has a vexillum, it can be used to teleport you to the Clan Camp northwest of Port Sarim. Walk straight south and follow the shoreline to Thurgo's house. After getting past a certain point in A Fairy Tale Part II, you may use the fairy ring code AIQ which will take you to Mudskipper point. Walk north past Thurgo's house and around the little rock platform. 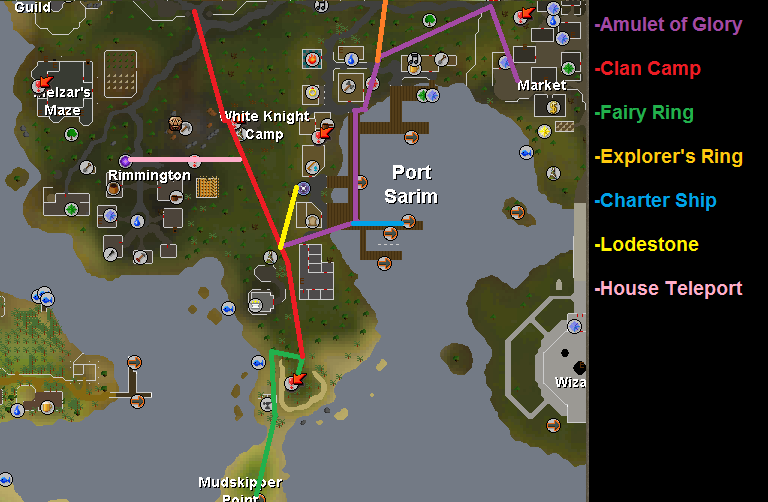 If your player-owned house is located in Rimmington, teleport there and walk toward Port Sarim, but turning south before reaching town. This spell requires level 40 Magic and one earth, air, and law rune. If you do not meet these requirements, you can use a house teleport tablet. If you are a lower level running through the dungeon doing the Knights Sword Quest and find that your energy is running low, there are two places in the dungeon that you can sit and rest safely to let your energy restore without getting attacked. There are a couple of things in the dungeon other than combat. The first thing is that there are three spawns of 1gp by the Pirates. The other things are Blurite Rocks used to get Blurite Ore during the Knights Sword Quest. 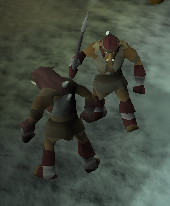 They also play a part in the Defender of Varrock quest. Aside from questing, they are used to make Blurite crossbows and bolts. 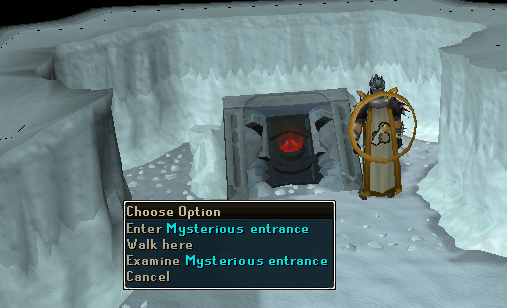 If your Dungeoneering level is 85 or above, you may find a resource dungeon here. 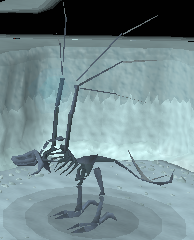 There are 12 Frost Dragons inside which drop valuable Frost Dragon bones. Killing them may be a very worthy option to consider if you are a higher combat level and want to increase your wealth. If you are training Summoning at a lower level, Ice Warriors and Ice Giants have a high drop rate of gold charms. Their combat levels are 78 and 74 respectively. While most of the dungeon is accessible to free players, there are some members only features. 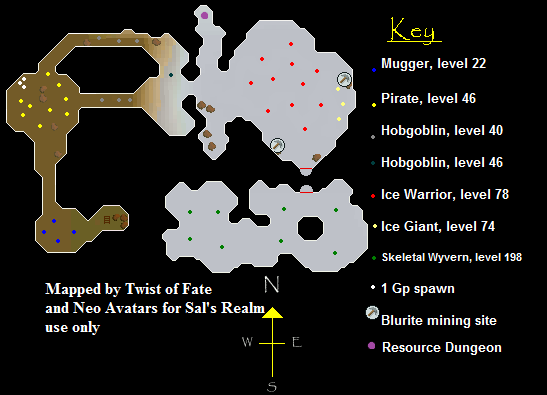 The resource dungeon being the first, and the Skeletal Wyvern cavern being the second. Skeletal Wyverns are level 198 dragon related creatures that require level 72 Slayer and a relatively higher level combat to kill. 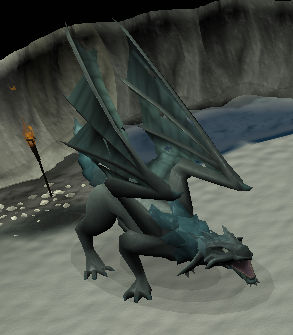 They are known for having the very rare chance of dropping the Draconic Visage. You MUST have an Elemental, mind, body, cosmic, chaos, or Dragonfire shield to enter. Normal Anti-dragon shields WILL NOT WORK. If you do not have any of these, you will take heavy damage from these creatures and die quickly. Super Antifire potions will not provide protection. 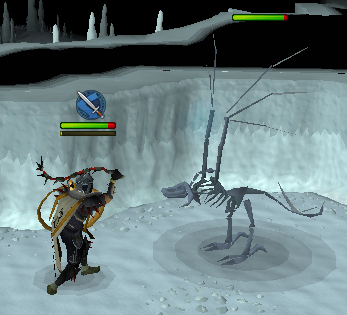 Skeletal Wyverns attack with melee and ranged. They have an ice breath attack which can freeze players. Muggers are aggressive to players under level 45 combat. They are found toward the beginning of the caves. If you are not paying attention, they can deal some heavy damage. If you are a lower leveled player, perhaps bring some extra pieces of food when you run past them. Hobgoblins are also aggressive to lower leveled players and can be found just past the muggers. 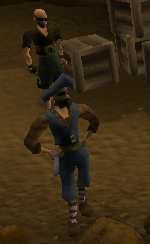 Pirates are aggressive to players under level 83 combat. They hit accurately and quickly. These are sometimes used for training, but this location only offers three spawns. They are aggressive to players under level 149 combat. If you are trying to avoid fighting them, be prepared as they can hit up to 185 damage. 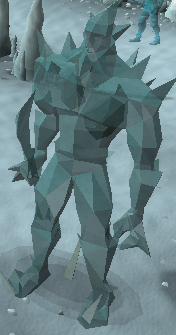 Ice Warriors are aggressive to players under level 156 combat and even though they do not hit as high as the Ice Giants, they attack fairly quicker than Ice Giants. Medium leveled players may train on these to obtain gold charms and common rune drops. They also drop medium leveled clue scrolls and have a rare chance of dropping Starved Ancient Effigies, just like Ice Giants. 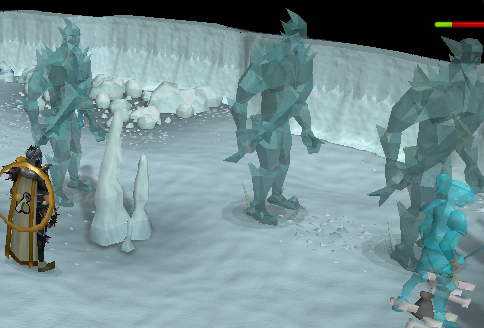 Frost Dragons are accessible here for players who can enter the Resource Dungeon at level 85 Dungeoneering. Killing these is highly profitable and can also be useful for prayer training, or obtaining money to train prayer. Dragon fire protection is necessary. Skeletal Wyverns are very dangerous to unprepared players. While fighting them, an elemental, mind, body, cosmic, chaos, or Dragonfire shield is necessary to avoid a quick death. You will receive a warning message before entering their cavern to prevent accidents.